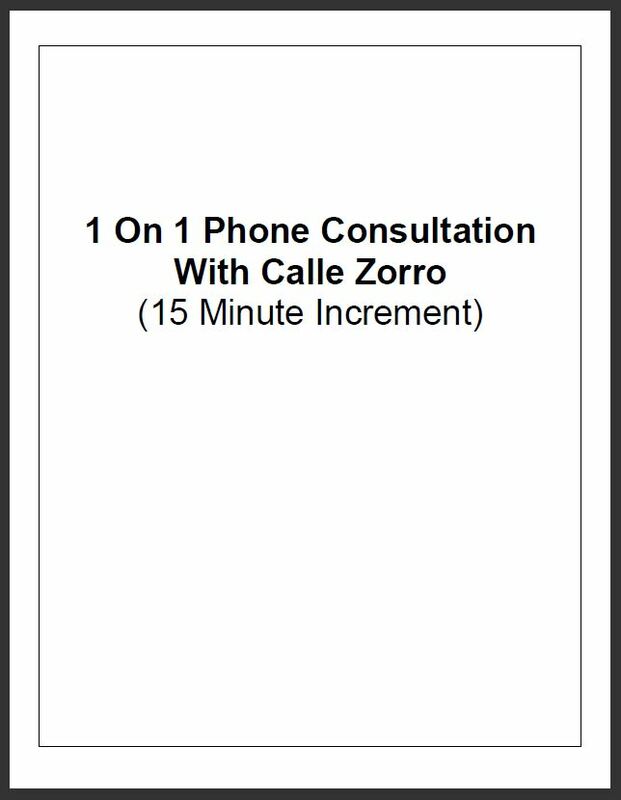 If you want one-on-one marriage / relationship help by phone … if you are looking for customized, personalized help for your situation … if you want to talk with and ask questions of me (Calle Zorro), then this is the item for you. Now, if you have had experience with traditional marriage counselors, I must warn you that I am very different. I do not care about “how come…”. I do not care about “whose fault…”. I have NO interest in psycho-analyzing someone, mumbling a bunch of psycho-babble back to them, and ultimately never really providing them with any real help. I do not want you hanging out with me. I want to get you and your spouse hanging out TOGETHER…having fun together, getting “naughty” together, showing any children you have what a happy home and marriage you have together. That is what I want for you. If that is what you want for you too, then get yourself an hour or two of phone help time and let’s get started on fixing your situation. NOTE: The above price is for a single 15 minute increment. So, make sure you get the number of increments that matches the amount of time you want to spend with me.